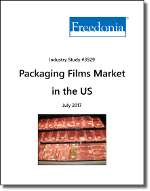 The US packaging film market will grow 1.2% annually to 6.5 billion pounds in 2021. Greater demand for high performance, multilayer barrier films will spur advances across most major food markets. While nonfood packaging represents 28% of total demand, applications are growing due to better resin structures and manufacturing capabilities. LLDPE and PET are forecast to rise at above average rates through 2021. This Freedonia study presents historical demand data (2006, 2011, 2016) and forecasts (2021) by market (meat, poultry, and seafood; snack food; dairy products; baked goods; candy and confections; produce; frozen food; grain mill products; beverages; pet food; paper and textile products; pharmaceuticals; rack and counter; medical products; agricultural and horticultural products; chemicals) and resin (LLDPE, LDPE, polypropylene, PVC, HDPE, PET, nylon, polystyrene, PVDC, EVOH, bio-based plastic). The study also evaluates company market share and analyzes industry participants including Bemis, Sealed Air, Sigma Plastics, Berry Global, ProAmpac, Winpak, Printpack, and Inteplast.